Chain letters don’t scare me. My soul has been damned dozens of times if you count how often I have deleted or ignored an email, Facebook post, or tweet that has warned me to repost or forward a “blessing” in order to avoid certain dire consequences. Except, when Jill Nojack tagged me in a literary chain I’d never heard of before, it pushed a button that I cannot, apparently resist–my vanity. You see, Jill is from @indieheart and did a great review of Bend Me, Shape Me last year when it first came out, so her calling me out along with Catherine Lea and Peter Maughan tells me she thinks enough of my work to want to call it to the attention of her readers. Or at least that’s what I choose to believe. Most of the writers I’ve looked at who participated in this chain have answered four basic questions. The only one I’m really interested in, though, is the last one: How does your writing process work? I’ve been using a new program called Scrivener and I am fascinated by the tools it has available to enhance and complement my writing process. 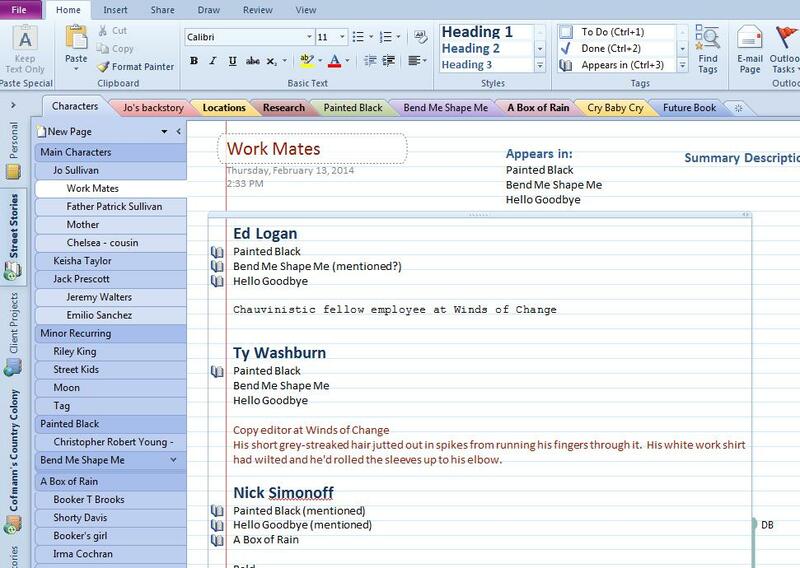 The combination of Scrivener and Microsoft’s OneNote seems to me the perfect combination right now. For research and to keep track of names, locations, and research for the series, I’ve been using OneNote for quite a while and will probably continue to do so. The program works on both MAC and Windows but has more bells and whistles on the PC. Scrivener, on the other hand, has more perks in Mac mode (at least for now—they are bringing the Windows version up to par in the near future). So what I sometimes do when I’m home is have both my desktop and laptop on and running the program that gets me the max for my money. In One Note I do character sketches and brainstorming about the plot. Once I have an overview of the main story, however, I switch to Scrivener and start imagining scenes to go with it. Each index card is a scene, although with this book each scene is likely to end up as its own chapter, too. For some reason I always need to get the first scene figured out in detail, and sometimes even written, before I can start coming up with ideas for the rest of them. Once I get that out there, I just start thinking: What is the natural progression of actions? Since I know my characters well, I know how the events in the first scene are going to affect them and thus start the chain reaction: action, reaction; stepping forward, and being forced back. Each action gets its own note card, sometimes with quite a bit of detail included in the summary and sometimes just with a single idea. I write down every possible scenario, even some I’m not sure I want to use. The more questionable ones, I keep toward the end, but when I’m writing and get stuck, I look through all of them to see if maybe they will work. Once I know the sequence of events, I go through and decide whose point of view would work best. The Street Stories books are always told through the eyes of three characters, my main protagonist Jo Sullivan, the main street kid, and one other character. I choose to color code by POV so I can tell at a glance if I’ve got too much of one character in a row. I slip white note cards into place to show the timeline of when each scene takes place that day. Now I’m ready to begin actual writing. Each index card opens into a separate document. I could easily work on any scene I want to as inspiration strikes, but usually it works best for me to start with scene one and continue on so I can test if the action/reaction makes sense. You can format the view font any way you want to. As I’m writing, if I have any side thoughts or To Do items specifically related to that particular scene, I jot them in the Document Notes section on the lower right. If the thought isn’t tied to the scene but the whole story itself, that same area can be switched to Project Notes. When I complete the first draft and go into edit mode, I will go through these notes one by one and resolve them. If I need to make a note about a specific word or section of text, I will select it and add a comment. Comments here work much like they do in Word and I usually don’t worry about them until edit mode happens. If the note is simpler–say I don’t want to take the time to decide a minor character’s last name right now because I’m on a roll–I will make the note as an Inline Notation which show up in the body of the text. These often get fixed later during the same writing session, once the running heat of the muse has been satisfied. 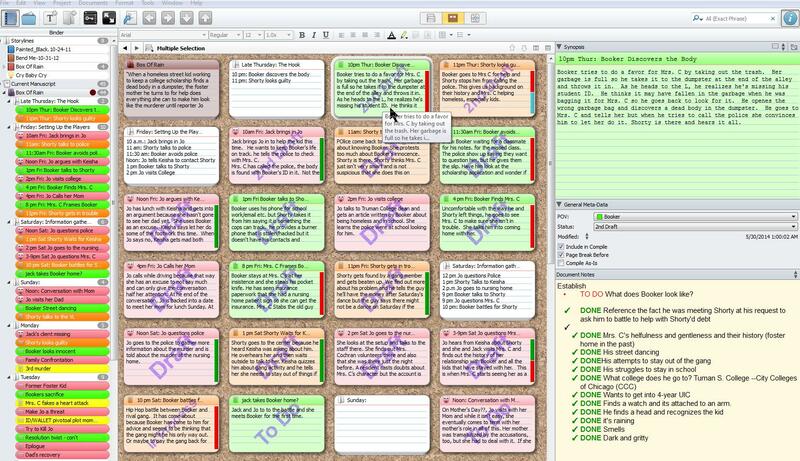 Scrivener has lots of other tools that I suspect I will probably find ways to use to my advantage, like keywords, document references, and the ability to create my own meta data. During this initial courtship, however, the only other one I really rely on is the Project Target statistics. In addition to setting a word count goal for each scene, if I tell the program how long I want the book to be and when I want to complete the first draft, it will calculate a daily writing goal for me. 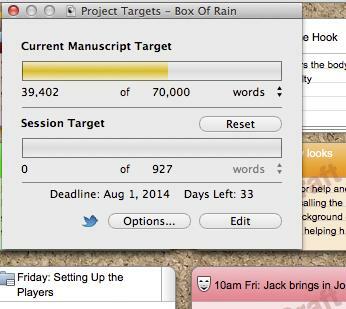 If I get more words done one day (or less, which is most often the case) it adjusts the count for the next session. This is a tremendous carrot that keeps me moving forward because it makes me feel that yes, I can get this book done on deadline. Now it’s time to tell you who I’m tagging as the next victims–er, writers–in this literary chain letter. Fellow New Libri Author Judith Kirscht recently released her third novel, Home Fries which is a finalist in PNWA’s Nancy Pearl award. Shari Rood just released her second novel, Blood Brothers, and moved to South Africa so she should have lots that is interesting to say. And Annie Walls is not only the author of the popular Famished trilogy, but a great artist as well. She designed the banner for my Facebook page. This entry was posted in Musings, The Author and tagged Annie Walls, Judith Kirscht, Scrivener, Shari Rood, The Writing Process by dborys. Bookmark the permalink. Where have you been all my life? I love Scrivener and I have been trying to learn its voodoo, I love how you color coded things. Can you direct me to a tutorial or how you figured out how to color code and manipulate the corkboards, index cards, the water marks??? I need ALL OF THIS!! Mostly I just learned by messing around with it, but there are lots of blogs out there with people offering tips and tricks. Just google scrivener, and be aware that some things work differently for different versions, so make sure the top you’re reading matches the version you’ve got. Also, the Windows version still doesn’t do everything the Mac one does, but is still worth it. Nice information about your process. I enjoyed reading it. (And I am looking closely at those spoilers for Box of Rain!). 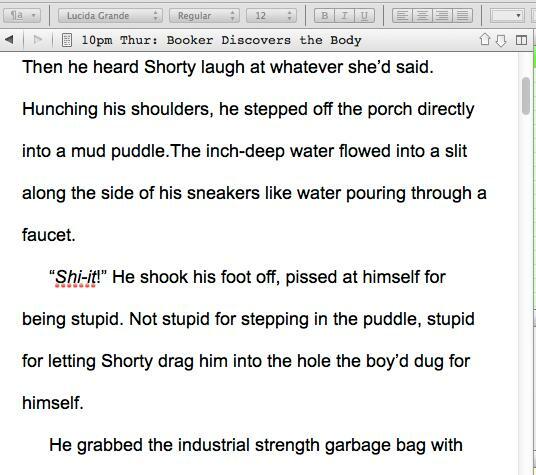 I have looked at Scrivener before, but I find that yWriter fits better with the way that I think. I may take another look, though, because seeing it the way you describe it, it looks like it has some very powerful tools. Add a writer, you know that some of those spoilers may very well get cut by a blue pencil by the time the book gets released, though. I’m glad you enjoyed the read. Scriveners does offer a 30 day non consecutive free trial of you want to try them out. The Windows version is almost as versatile as the Mac and will be soon. If you don’t want spoilers for Box of Rain, don’t read the text in the images too closely, but if you are curious about the writing process I am using to complete the book, this article I posted on my author blog might be of interest to you.